Hello from Portland, in the middle of a very busy couple of weeks, where the last thing I needed was for the post office to once again tell me that they were OUT OF STAMPS. In the middle of a thousand errands I had to go to another post office and wait in line again to get the stamps and then stand outside at a picnic table putting them on as fast as I could. I made my kids help too, even though they're too young to get a stamp on straight. We got them back inside at about 4:58 on Friday, a terrific relief to me because Monday is Veteran's Day (thank you Veterans, thank you very much). I'll also have 5 kids staying at my house all weekend and wasn't sure I could keep the bundles safe. Among the many interesting things in this bundle is a page from Lawrence Peterson's project called The Rosary of Precious Gems (you can watch a video about the project on the AAPA website). What is interesting about this submission is that he sent me 150 assorted pages, so while you might receive The 10 Things to Be Practiced, your neighbor could get The 10 Necessary Things. Or the 10 Useless Things, or The 10 Great Joyful Realizations. I hope everyone gets just the right one. I hope you all enjoy the bundle and these days of gratitude. 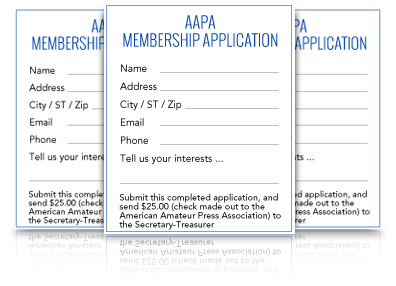 Thanks for being members of the AAPA. Thanks to Ivan for all the type and all the help and for the beautiful type cabinet, thanks to Mike Coughlin for printing the envelopes, thanks to all the people who write and print in the bundles, thanks to Clarence for all the fine looking work and the AAJ.